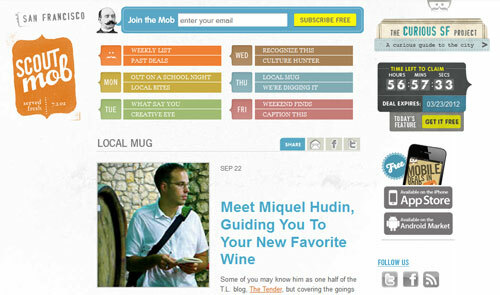 We need to give a great deal of thanks to Scoutmob SF for their recent coverage this week. For those who aren’t aware of Scoutmob, it’s similar to Groupon and Living Social except that it does an exceptional job of providing local coverage of their deals. In fact, even if you’re not interested in their daily deals, the write-ups are great reads thanks to Breanna Lambert’s wordcraft. Beyond the deals though, they cover various locals and other items of interest. Such was the case in giving some exposure to Vinologue and what we’re doing and how our wine guides are different. Again, thank you Scoutmob and may you stay around when the other deal giants fall.